If you've been managing a Facebook Business Page over the past few years, you've likely noticed a drop in how many of your fans have been viewing and interacting with the organic posts you publish to that page. This observed decline in organic Facebook reach began in 2014, when Brian Boland, Facebook's VP of Advertising Technology (at the time), said Facebook is simply managing more ad content than it used to, and News Feed space is thus more competitive among marketers. Boland, now Facebook's VP of Publisher Solutions, is right. There's simply too much content being published on Facebook, making visibility in the News Feed increasingly competitive. And Facebook strives to show people the content that is most relevant to them, as opposed to surfacing all the content available. More recently, you might've noticed a greater dip in the organic reach of your Facebook content because of an important change to Facebook's News Feed algorithm. In January 2018, according to Facebook's Head of News Feed Adam Mosseri, Facebook began to "shift ranking to make News Feed more about connecting with people and less about consuming media in isolation." As a result, marketing content was poised to take a backseat to content by friends and family -- a value that Facebook says it originally had, and that it's trying to return to. The good news in all of this is that there's a lot you can do to counteract these changes, like being more selective about what you publish, paying attention to when you publish, and putting money behind your posts (a.k.a. "boosting" them). 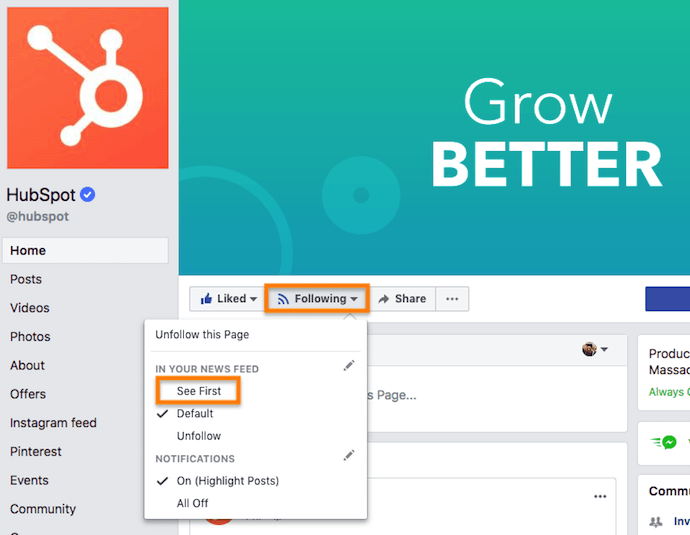 Before we dive into how you can improve your Facebook Page's organic reach and reengage your Facebook followers, let's explore exactly how Facebook's News Feed algorithm works. Then, we'll see how various algorithm changes -- including its 2018 update -- have affected the reach of a marketer. On the other hand, Facebook has identified for marketers the content formats that drive engagement and sharing -- native and live videos. Facebook ranks live videos higher in the News Feed, as well as videos with higher watch and completion rates and videos that are clicked on or unmuted as signals of viewer interest. Ultimately, there are thousands of factors that inform Facebook's algorithm of a meaningful interaction. These factors range from using trigger words that indicate important events (e.g., "congratulations") to whether or not you've actually clicked a link in a post before liking it. Today, Facebook rewards the content that produces these interactions the best: person-to-person content. Facebook's end goal here isn't just to match News Feed content to the individual interests of each user -- it's to display News Feed content that reveals connections between each user. "Interacting with people ... is associated with a greater sense of well-being. And the benefits [to the content creator] are even stronger when you're close to the person, and when the interaction requires some effort." What Is Facebook Reach and How Has It Changed? Facebook defines organic reach as "how many people you can reach for free on Facebook by posting to your Page." Prior to 2012, that number used to be much, much higher than it is now. From the moment “Fan Pages” launched in 2007, anyone could create a Page for their company or organization, start collecting fans, and post unlimited messages to their fan bases with the assumption that they would see those messages. When 2012 rolled around, Page managers learned that only a fraction of their Facebook fans -- 16% on average -- were seeing their Page posts in their News Feeds. And that fraction got significantly smaller in 2014. A study from Edgerank Checker found that between February 2012 and March 2014, organic reach for the average Facebook Page dropped from 16% to 6.5%. Research from Social@Ogilvy, meanwhile, suggests that for Pages with more than 500,000 Likes, organic reach could be as low as 2%. Based on the figures above, that means a Page with 10,000 fans could expect just 650 of them to actually see that Page's posts in their News Feeds. For a Page with 1 million fans, about 20,000 would end up seeing posts (based on the 2% figure). SocialFlow analyzed more than 3,000 posts by publishers on Facebook and found that organic reach dropped 42% between January and May 2016. In the blog post announcing the algorithm change, Facebook Engineering Director Lars Backstrom warned that Pages could anticipate a dip in organic reach -- which could leave reach lower than that earlier 2% estimate, in some cases. 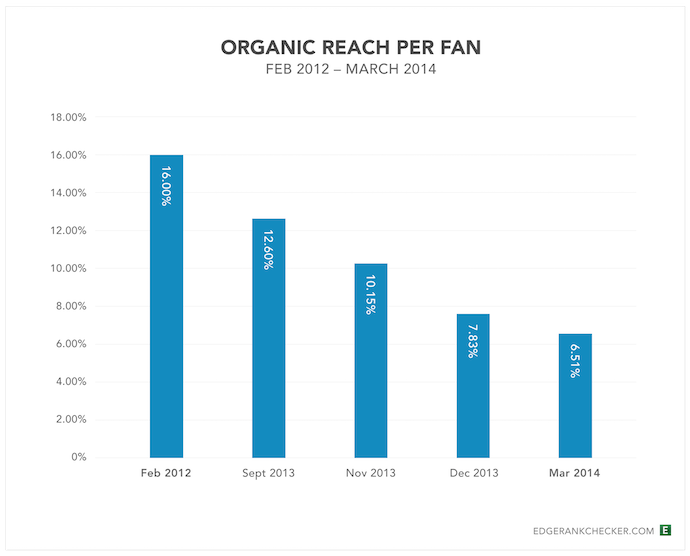 After this algorithm adjustment, SocialFlow adjusted the decline in organic reach -- which had dropped further. Between January and July 2016, publishers saw a 52% decline in organic reach on Facebook. Facebook's biggest algorithm update for 2017 wasn't an algorithm update, but rather a new News Feed entirely. Just days after Facebook launched this alternative News Feed test, a social media manager for a newspaper in Slovakia reported that 60 of the largest media pages in the country saw their likes, comments, and shares decrease fourfold. Facebook's recent incident of data misuse by analytics firm, Cambridge Analytica, prompted Facebook to deeply address the privacy of users who don't want their personal information exploited in various ways. If the content is shared over Facebook Messenger. If the content is Liked or commented on. If the content receives multiple replies. Shares and comments, in particular, are considered "active" interactions, which Facebook considers more "meaningful" when slotting content on a user's News Feed. For that reason, the company notes that video watch time, referral traffic, and organic reach might decrease this year if the content doesn't doesn't stir up a meaningful interaction. Should You Increase Your Paid Content on Facebook? Fewer people seeing your Page's organic posts on Facebook means fewer clicks, comments, and shares. And having fewer of those interactions means fewer conversions, leads, and customers. But this is only the case if your content doesn't attract comments and shares to begin with. So, why would Facebook decide to decrease organic post visibility in favor of friend and family content in the first place? How can a marketer create content that competes with the natural appeal of a friend's new baby picture? Some publishers have cracked the code when it comes to engagement on Facebook: by publishing and broadcasting video. (And we'll get into that later in the post.) But many in the marketing world suspect that Facebook had (and still has) an ulterior motive: to get people to start spending more on ads and "promoted" content. So, should you invest in more ads and paid content to get the exposure you want? Is Paid Content Worth It? As Facebook has evolved into more of a paid marketing platform than an organic one, Page managers are realizing they’re now expected to pay for ads yet again to reach those newly acquired Fans, even if those Fans have seemingly elected to see a brand’s posts by liking their Page in the first place. From Facebook's perspective, it’s simply not an ideal user experience to flood the News Feed with posts just because a Page has lots of Likes and is publishing prolifically. Should you trust Facebook? Are paid ads on Facebook worth it? 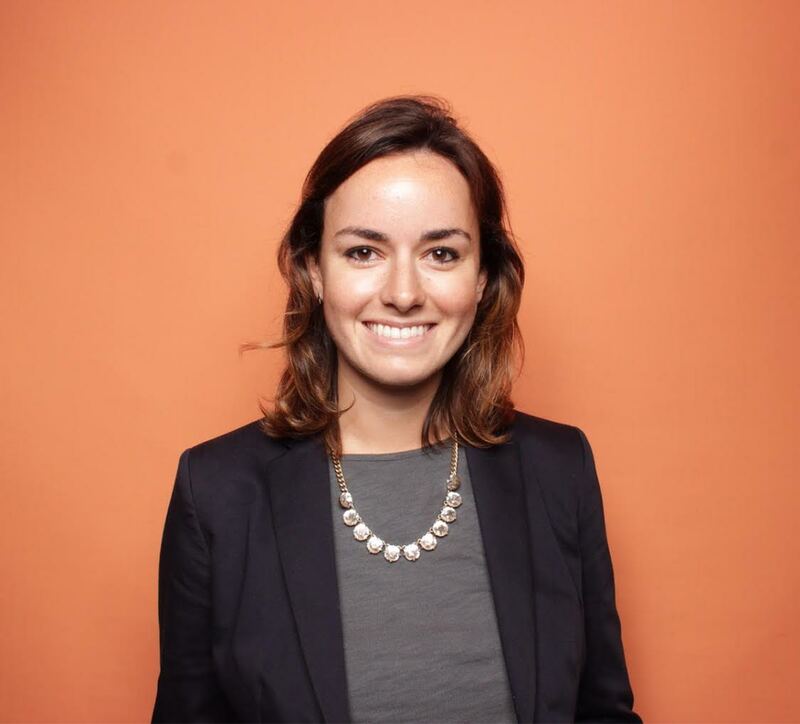 They can be -- especially if they're part of a longer content campaign, and can stimulate interest in a story that users might not see otherwise. Learn more about how to advertise on Facebook effectively in Step 8 further down in this article. Now that you've got a better understanding of how Facebook surfaces content, let's explore some tips for dealing with the decline in organic Page reach. 1. Be more selective about what you post. Marketers have to switch gears from untargeted, frequent publishing to targeted, selective publishing. The goal is no longer to spray and pray -- it’s to get as much interaction from a single post as possible. Each post published to a brand Page can be targeted to a specific audience regardless of whether or not it’s sponsored, which may improve overall interaction with that post among other people who are likely to find it more interesting and relevant. 2. 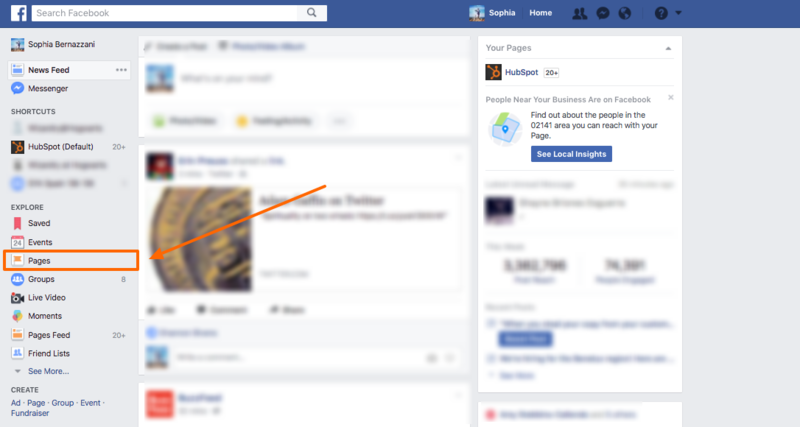 Remind your Fans they can go to Pages Feed on the left sidebar of their News Feed to see content from Pages they've Liked. 3. Educate your super fans that they can update their notification settings from your page. 4. Encourage fans to engage with your posts when they do see them, so they see more of them. This can be as simple as adding a reminder to "Please Like and share" at the end of your posts. 5. Share engaging videos on Facebook. Videos on Facebook are engaging and make visitors more likely to stop, watch, and maybe even unmute when they spot them in the News Feed. 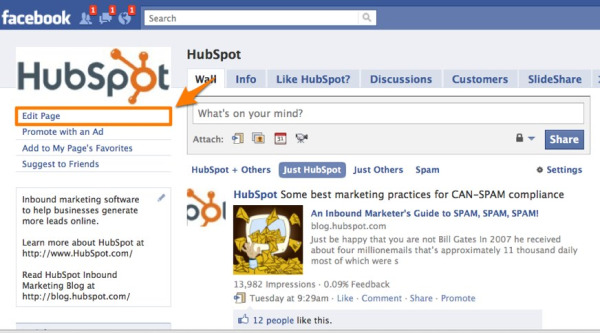 Use videos with captions, animations, and engaging visuals to draw in Facebook users' attention. 6. Broadcast on Facebook Live. To learn more about Facebook Live broadcasting strategies, check out our free guide. 7. Re-allocate your time and effort toward your owned assets. 8. Start treating Facebook like a paid ad platform. 9. If you do advertise, go beyond the basics. Lots of Customizable Reporting: Create reports based on metrics that matter most for your business. To learn more about how you can improve your Facebook Page's reach, check out our free guide: How to Attract Customers with Facebook.